So the other day I was having troubles closing the lens to my camera. I went and told Seth that it wouldn’t close and if he could fix it. He had to jam it shut in order for it to close. A little sand from the beach was stuck in it. Seth was now determined to get this sand out. With a little Internet research he figured out how to dissemble the entire camera. He got the sand out, but then didn’t know how to put the sucker back together. 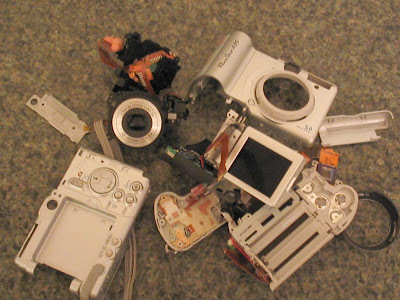 I gasped when I saw my camera in pieces. Then he mention that he didn’t know how to put it back together, and it was done. Well, my fellow bloggers, you know how much we use our cameras. So, I was devastated especially since Stella’s birthday party is this weekend. Lucky, we have an old camera, that’s not the greatest, but it will do until now. In the meantime I’m in the market for a new camera. The post Busted Camera appeared first on Darling Darleen | A Lifestyle Design Blog .